The GLORIA Series of Stepper Motor control system is an easy-to-use, plug-and-play and cost effective solution for Stepper Motor control applications. It may be used as a stand-alone unit or may be commanded by an external device. 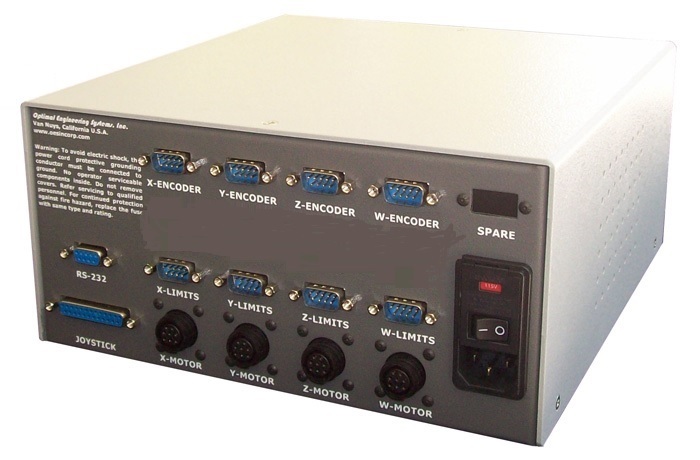 Each system includes the power supplies, the motion controller card, the micro-stepper and/or servo motor drivers. The supplied user friendly Control Panel software allows the user to set-up the module quickly. The operator is able to move the mechanism to different positions by pressing the corresponding buttons of the Control Panel or by using the joystick and/or trackball. The motion profile may be recorded using the "Teach Mode" capability of the software. This profile may be uploaded to the controller to repeat the same exact Stepper Motor. The motion parameters are manually entered in the control panel by typing the desired values in the corresponding fields, or may be read from a text file. The system can also be operated using an analog joystick or a trackball. The speed of the motor is proportional to the tilt angle of the joystick or the rotational speed of the trackball. This series is suitable for DC servo motors. This series is suitable for Brushless DC servo motors. For a different configuration, please contact us for a prompt quotation.